Shadow of the Tomb Raider was one of a handful of AAA titles which was highlighted and featured during the launch of the Nvidia GeForce RTX rage of graphics cards. HEXUS reported upon the release of the first RTX gaming technology videos the day after the launch, when they were shared by Nvidia and partners on YouTube. 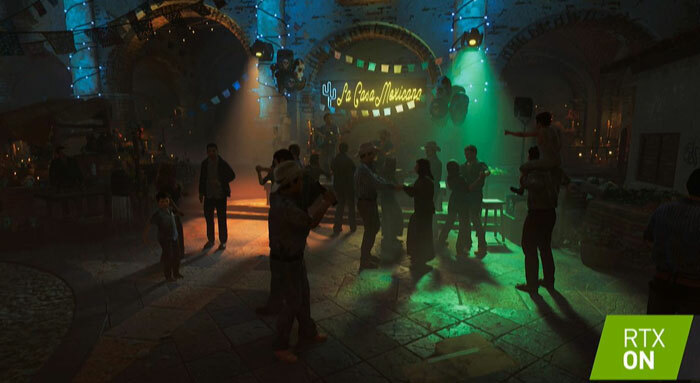 Those videos, released back in August, included previews from Battlefield V, Metro Exodus, Control, Atomic Heart, and of course Shadow of the Tomb Raider. 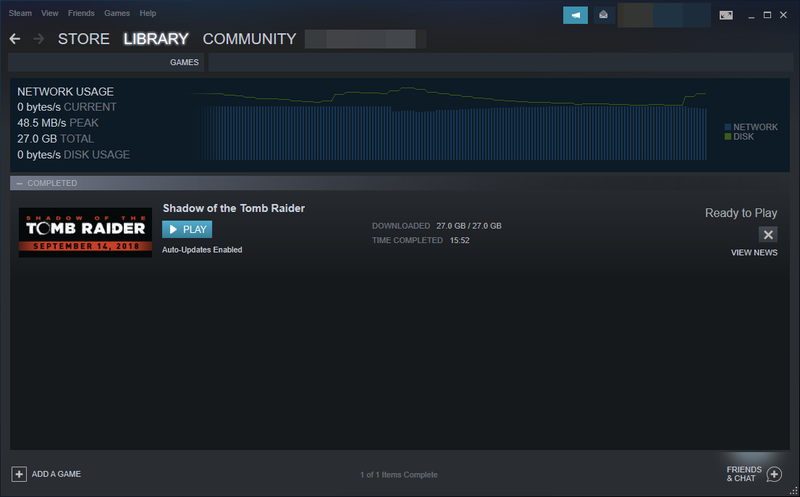 Now, at long last, the Shadow of the Tomb Raider game on PC has been updated to support Nvidia's raytraced shadows, and DLSS technology. You can find the game patch and release notes available on Steam, and the update should auto-apply if you open up the Steam client then fire up the game. Before you run the updated game you might want to check you have the latest version of the GeForce graphics driver, for optimal performance. Nvidia's latest drivers 419.35 and up. With the above conditions satisfied, in game you will be able to set the raytraced shadow quality from medium to high to ultra, and adjust DLSS settings, among many other graphics quality options. 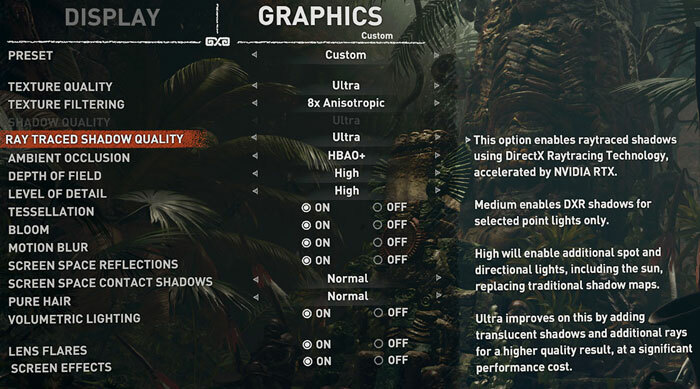 TechPowerUp has already tested the full range of GeForce RTX graphics cards in Shadow of the Tomb Raider and usefully compares image quality and performance over several pages in a special feature it has published. Interestingly, TPU concludes that the raytraced shadows feel simply like an additional high-end quality setting rather than a game-transforming addition. The frame rate performance hit for turning on raytraced shadows is somewhere between a 30 and 50 per cent reduction. Remember, next month, after Nvidia releases a new graphics driver, those with GeForce GTX 1060 graphics cards and better will also be able to test out the raytracing facilities in this game. However, without the specialised RT cores, turning 'RTX On' on your GTX card might not be advisable for optimal gameplay. 50 percent even with dedicated hardware, jesus christ! have a question about the ray tracing and the other options though.. should we still need ambient occlusion, and screen space options and volumetric lighting on? Been waiting a while for this update, I'm really hoping it'll look as good as the demo videos showed it to. Definitely needs optimisiation mind - but then we've seen that with the other initial RTX launches too, and I expect we will see another update in the coming weeks which will improve the FPS further. Still, 60FPS is the target and it hits that very well for me. Worth the wait!